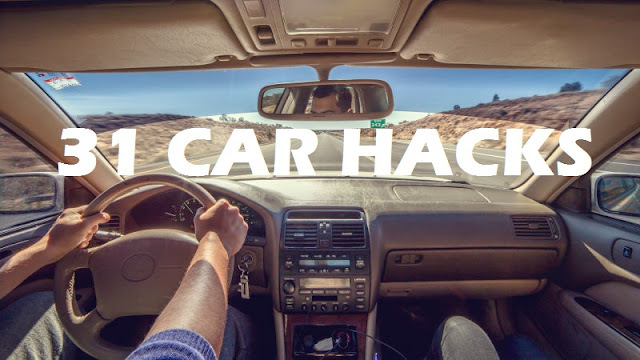 Home / General Knowledge / 31 Awesome Useful Car Hacks Every Drivers Should Know !! Don't change lanes during a traffic jam. Studies have shown that it won't get you out any faster and increases chances of getting in an accident. If you're going somewhere cold, your doors might freeze shut. To prevent this, coat all of the rubber on the inside of your doors with cooking spray and then wipe it down. If you can't get a sticker off your window, use warm water to soak some newspaper and place if over the sticker for 10 minutes. Keep an emergency kit in your trunk include a cheap mobile phone, toilet paper, blankets, water and snacks. Bring an inflatable pool floatie on a road trip and you have a bed. On a hot day, turn your steering wheel 180 degrees when you park so that the top isn't burning hot when you return. Most gas stations offer free air to inflate your tires. This will increase your gas mileage significantly. If your car still has a tapedeck, use it to hold more modern tech in place. If a truck suddenly slows down, so should you Truckers communicate with each other about speed traps. Exit signs are positioned to the left or right depending on which side the exit is on. Use a mesh bungee for a coat hanger. Use a showers caddy to store the oil and other liquids that you need for a road trip. If you don't have a phone holder, use a rubber band. When filling your tank, hold the trigger halfway. You'll get more gas and less air in the tank. Keep an open box of dryer sheets in your car, they're cheaper, longer lasting, more effective and nicer smelling that cheap air fresheners. If you rent a car for a trip, take pictures of it beforehand so that you can't be blamed for anything already wrong with it. If you get stuck in mud or snow, use the floormats inside your car for traction. To cool down a car without a/c while driving, only open the driver and passenger windows. Keep the back ones shut and the breeze will be a lot stronger. If you need repairs on the road and don't want to get conned, ask any potential mechanic about a part of the car that you know is in good shape. To cool a hot car in seconds, roll down one window all the way, then walk to the other side of the car and open and close the door a few times. Parking your car somewhere unfamiliar? Drop a pin on your phones map as soon as you get there and you'll have no problem getting back. Holding your car remote under your chin will increase its range. Scratches can be fixed with clear nail polish. If you get stuck in a traffic jam, pay attention to which lane the 18 wheelers are using. They have radios and usually let each other know which lanes to avoid. If you get road sick, tilt your head to the side and it'll go away. Shower organisers are great for travelling with kids. If you're driving an unfamiliar car, the arrow next to the gas pump shows which side of the car the gas tank is on. If you can see the flank of your car in your wind mirrors, they're positioned wrong and potentially unsafe. The best way to avoid blind spots is to position mirrors so that no part of your car appears in them. To keep your windows from fogging, cut a clean potato in half and rub it on the inside. If you're heading on a long trip, use a cereal box as a trash can. If you ever got lost, ask a fast food delivery place for directions.